Warface Producer Defends Female Designs as "Cultural Relativism"
The female character models in Crytek's Warface are different around the world but still unrealistic. Every region in the world has its own cultural differences, but the male gaze in gaming feels like it's doing its best to stay. 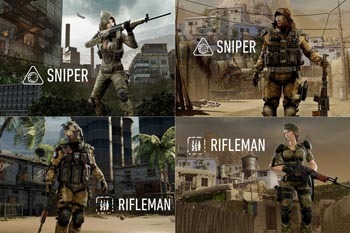 Crytek's free-to-play online shooter Warface is a game that differs around the world, keeping in mind that different cultures expect different things in life and in games. For example, weapons have different recoil levels in different regions (high in Russia, low in Asian regions). Furthermore, the design of female character models changes by region. In a set of images, one can see the male character models are completely covered in a more realistic set of military gear while the female models for the same classes draw attention to their cleavage. "The female skins [are] a good example of how we see how culturally the different regions approach the same game in different ways," Warface executive producer Joshua Howard said. "The skins we're showing right now are the skins that basically came out of our Russian region. They're not what our players at first requested in the Russian region. They tended to be considerably more extreme than what we ended up shipping with." Howard compares the Russian character models to the Chinese character models. He fails to come up with a good description of the difference, but he insists the Chinese models are "also disproportionate but in a way that's more...Chinese?" The concept of different designs for different regions based on that area's feedback is interesting until it falls to an unnecessary level of pandering to the audience that many game studios still can't leave alone. Howard mentions that there was tension between making the game cohesive and also making it appropriate for different regions. He compares the decision to change female character models and weapon recoil levels to the recipe for Coca Cola, which changes slightly in every region but is still Coca Cola. However, as Wired puts it, that "highlights the fact that the lady skins are being considered very differently than their male counterparts." While this problem is rampant in media today, it's disheartening to see it defended as "cultural relativism."